Breeder told me many times she is a purebred. My concern is the color pattern is this what you call a sable? 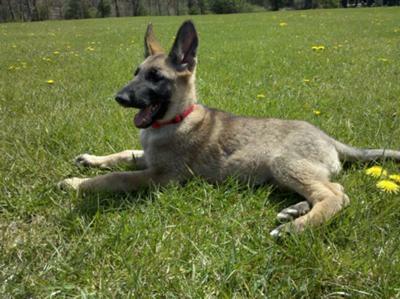 and also the face im not sure but i know shes around 10 weeks old and i seen pictures of GSD online and the face isnt close to mine. i just have concerns and wonder what my dog is. Also when do they get the bushy tail that is another concern of mine for my puppy her tail isnt bushy at all makes me wonder if shes a purebred like they said. Total German Shepherd: From the picture you've included it does look as though your new German Shepherd puppy could be a purebred German Shepherd. And yes, she is a sable German Shepherd puppy. Concerning her coat length, some German Shepherds have coats of different lengths and your GSD puppy simply has a short coat - nothing wrong with that at all. You can read about German Shepherd coat colors here to learn even more. Good luck with your new German Shepherd puppy.